One tiny arts grant; one month of summer; 14 young people; one dynamic dance practitioner; one public park; one newspaper article; some black and white flyers. These components comprised the founding of Stompin’ Youth Dance Company (now Stompin), the development of its mission and its first show in the summer of 1992. To the group’s shock and delight, a thousand people turned up to the park to see the show and they discovered they were onto something. Driving home from Stompin’s 2016 show Panorama, I found myself wondering about the nature and history of this company, which has continued to thrive, producing shows yearly since that first production almost 25 years ago. 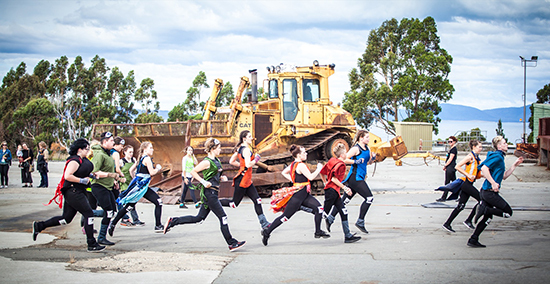 Devised for an ex-industrial headland in Triabunna on Tasmania’s East Coast, Panorama included a contingent of local school children in the choreographic sequences and involved members of the community in a wide range of ways. I was curious. 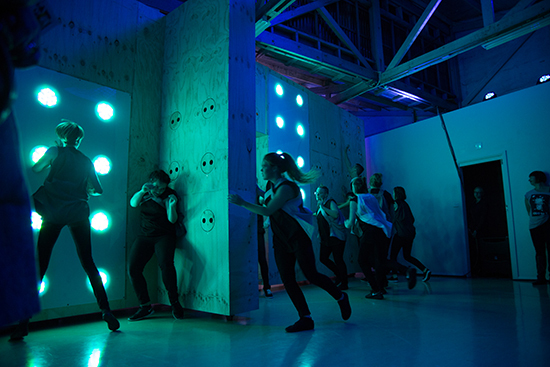 Was the expression of ideas through dance still the company’s first priority, or had the emphasis and energy shifted to other goals, such as community engagement? I spoke with founding director Jerril Rechter (1992-2003) and outgoing creative director Emma Porteus (2010-2016). Remarkably, 24 years on, the founding mission of the company has remained at the core of what Stompin does today: bringing great arts practitioners into the company to co-create works with young people, using dance as a vehicle to allow them as a group to learn about and express themselves, performing in and “owning spaces that they don’t normally own,” says Rechter. Even in that first month of development in 1992, the initial group of young people co-created the Stompin mission and the choreographic language of the show with Rechter. Working within the community and mentoring have been woven into the company mission since that time. All of these aspects have been distilled into the company’s current tag-line ART/YOUTH/COMMUNITY/4 EVER. Stompin has continued to seek and ‘own’ sites, producing work in vast industrial warehouses, in aircraft hangars, on beaches, in local swimming pools, on expansive industrial sites. While her favourite show is possibly still that first one, Rechter fondly remembers many others, including Arboreal from 1996, a performance she developed with the group for Hollybank Forest, north of Launceston. The ambitious work involved a large dance group, several bobcats, horses, fire, woodchoppers and opera singers. While the early days were definitely about building community, they initially related to the young company members and their immediate locale. This has expanded to include building long-term relationships with communities around Tasmania. Stompin worked with the community in Triabunna for a year leading up to the performances of Panorama in 2016, conducting fortnightly workshops with students at the local school and meeting with other town stakeholders. Porteus describes how it took six months, beginning with storytelling strategies, to build trust among the participants to the point where they could comfortably express their ideas through movement. She explains how working with those grade 5-8 students “cracked their world view open,” and reflects on conversations with one young participant, who was not only amazed and moved that people would come from all over the state to hear his story, but also became interested in joining Stompin as a result of his experience. At the show’s culmination, Emma found herself in conversation with Triabunna’s local council about funding for further Stompin work in the town. Collaborating with young people presents challenges, let alone choosing unconventional spaces for performance and bringing in other members of the local community. The shows that Emma sees as being most successful are those that matched the concept of a show with the skills, interests and passions of the performers: WeTubeLIVE and 6000 to 1. 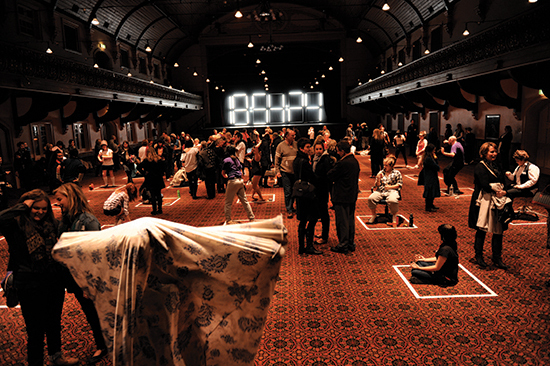 WeTubeLIVE allowed audience members to wander within a grid punctuated by one-metre marked squares, each containing a performer recreating or reinterpreting a YouTube clip of their own choosing. This wonderfully chaotic format supported a very broad range of skills. Skill levels became irrelevant when thrown into the kaleidoscopic mix. Together these young people presented a complex portrait of a moment in time that was particularly relevant to them. 6000 to 1 also keyed into the preoccupations of the age group, exploring the consequences of choice and chance, sometimes reflecting upon traumatic stories from the dancers themselves. Here, these personal connections and the atmosphere of trust and cohesion generated by the process fuelled the presentation by the dancers. These aspects were palpable within an emotional performance. Interestingly both shows were presented in enclosed spaces within Launceston, removing some of the standard site-specific challenges usually facing Stompin. Shows where all of the elements come together are the goal, but the notion of success for Stompin is broader and more multifaceted. As both Rechter and Porteus describe it, bringing a young person to the point where they are performing before an audience, in concert with the group, music and a set might appear simple, but there is a tremendous amount of work leading to that moment. Free of auditions, any young person can dance with Stompin as long as they commit to the program of creative development and rehearsals. They are offered a “safe, fun environment” within which to “challenge where and what their limits are,” Porteus tells me. They may become part of the company for several years and are equal players in the development of shows, working alongside established professionals to develop everything from the initial concept through to the dance language and the details of a production. Through a peer-to-peer program established with Australia Council funds in Rechter’s time, particular skills are passed on to those who demonstrate interest. 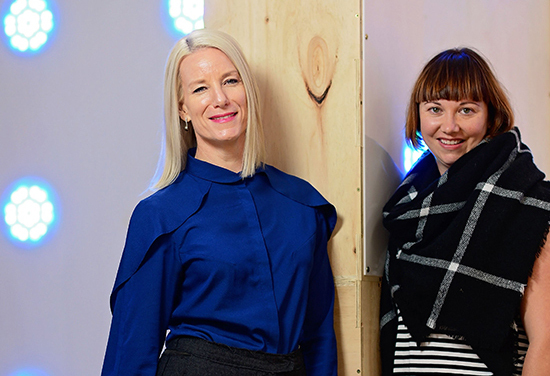 Mentored in choreography, sound, lighting, production or administration, young performers Bec Reid, Luke George and Emma Porteus became Stompin artistic directors. Then there are the accomplished young adults who leave Stompin to build careers across Australia and around the world, such as dance artists Becky Hilton, Adam Wheeler and Stephanie Lake. Rechter now works as the CEO of VicHealth and while that may seem a world away, she doesn’t view it that way, continuing to work with young people. With the knowledge gained from research into youth, she knows that a company like Stompin is critical to building resilience in its members as a protective mechanism against the difficulties of adult life. In answer to my question about the company’s priorities, the sense of continuity evident in the reflections of Rechter and Porteus confirms that dance remains central to the Stompin mission, with performances that are conceptually and aesthetically strong, but which also reveal that a bigger, richer story is created in the lengthy journey to reach each artistic outcome. Read more about Stompin here. 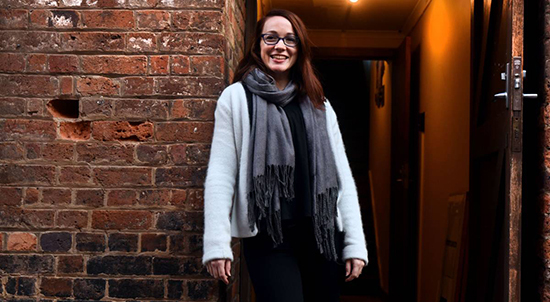 Stompin’s new Artistic Director is Caitlin Comerford who holds a Bachelor of Fine Arts (Dance Performance) from QUT and a Bachelor of Arts (Dance) Honours from WAAPA through LINK Dance Company. She has been a Brisbane-based dance practitioner, working in performance, installation and choreography and is a co-founder of MakeShift Dance Collective, which was nominated for an Australian Dance Award for Achievement in Independent Dance in 2015.